I hope this note finds you safe and warm. As I look out my window this rainy January morning, I hear the birds singing and see little green buds forming on the tips of branches . . . a sign that life is a spiral and trusting that each day we are turning to more light. As we prepare for Shabbat, I am aware that we are also entering day 34 of the United States government shut down. We, at The Shul of New York, recognize that some of you may be impacted by the shutdown and understand the financial, emotional and spiritual impact on your lives. Please let us know how we may be supportive during this time. 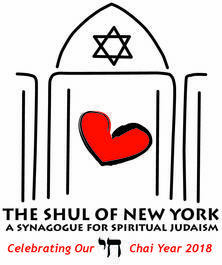 You may contact me at rabbieva@theshulofnewyork.org. Looking forward, I hope you will join The Shul Band and me as we proudly participate in Spiritual Sounds, an evening of music and prayers presented by many of our neighbors this Sunday evening from 5-7pm at Town and Village Synagogue. It is not too late to sign up for our Sunday morning series on discovering your legacy. . . How will you tell your story? You can find details here to sign up by Jan 31st. From my heart to yours, may you luxuriate in a Shabbat of peace, of compassion, of love and of kindness.